Those of you of a nervous disposition should look away now. This was NOT a good start to a day. Firstly, I tried to meet up with some other passengers who were trying to go to the Turbine despite P&O cancelling the excursion from under us. We arranged to meet at 9. They left early and went without me. Thanks a bunch. So we got off and made our way through the terminal and customs to the shore. HALF AN HOUR it took us. Now, granted mum is not the fastest mover on Earth, but there were no seats to take a break and no wheelchairs offered or available on request for less able passengers. We were just left to fend for ourselves and have to watch mum struggle for the best part of A MILE (no, really, I counted the steps on the way back and, assuming my walking pace is about three feet end to end, it was over three quarters of a mile). There were wheelchairs at the other end, but they were for HIRE ONLY and were chained up with no one in the building who knew who was in charge of them or where the key was. When we got to the other end, the exit was far from obvious and we found ourselves in a convention centre with what felt like 10,000 plastic surgeons all trying to book in. By the time I got out into the open air, I was on the verge of a panic attack. Luckily, said open air provided a bench for mum to have a rest, while dad and I confronted our next obstacle. Finding someone to help us go where we wanted to go. There were five tour bus reps and one welcome/information desk. That’s six people to assist, what, 2,000 people? More? There was also another cruise ship in as well, of course. The Oceanic Regatta, which no one had ever heard of*. The struggle for attention was exhausting and I eventually gave up and let dad deal with it. We eventually booked onto a free shuttle to Grouse Mountain and went to have a cup of coffee while we waited for it, in the Pacifica Hotel which was on top of the conference centre on top of the cruise terminal. Mum and dad both declared their respective drinks to be The Worst Cups of Coffee/Decaff They Had Ever Drunk. Don’t go to Starbucks on the ground floor but don’t go up to the Lobby Cafe either! 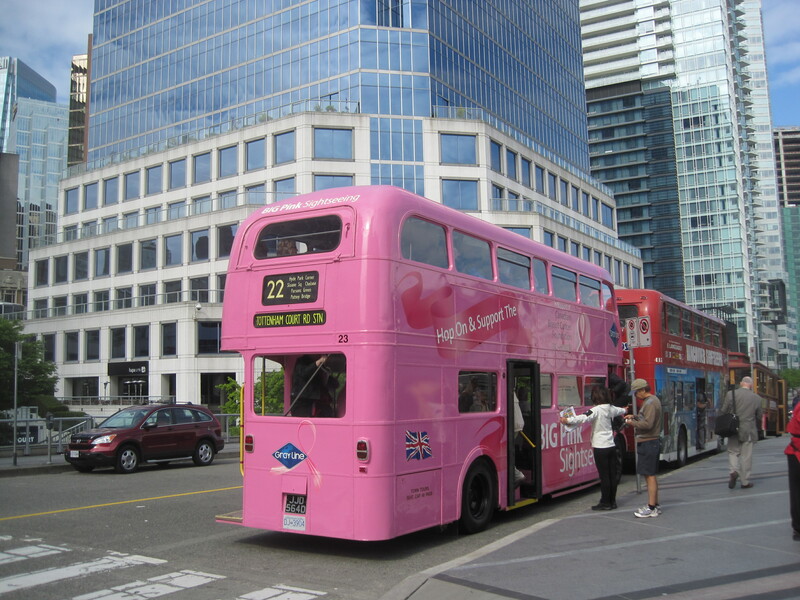 As an aside, one of the tours is the Big Pink Bus Tour (pink for Breast Cancer Research), which uses, amongst others, Routemaster buses from London (well, RML 609s, to be precise). They still say things like 23 to Tottenham Court Rd on the back! The driver of our shuttle bus, Susan, was a delight and showed us a little of the city on the way out to the mountain. 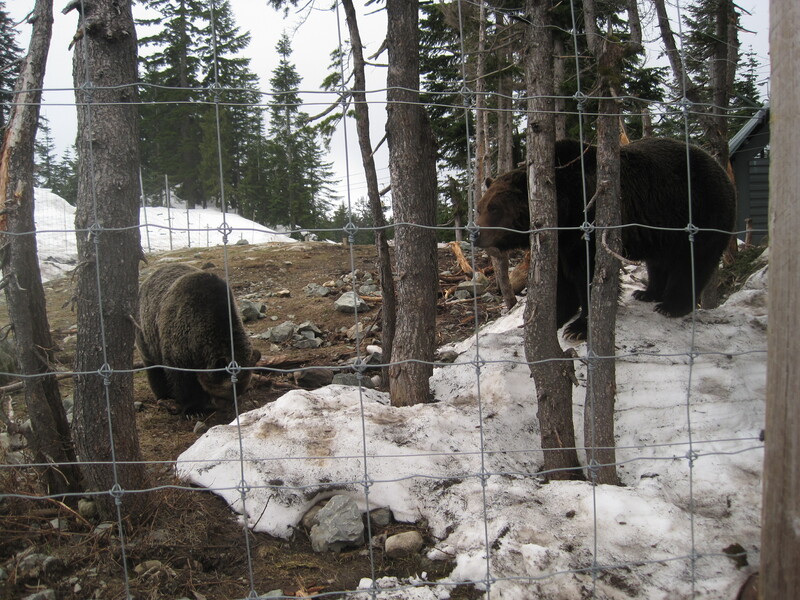 It was during the trip that we realised the bears mum wanted to see were at the TOP of the cable car, not the bottom. Oops. She did it, bless her. It was only eight-minute trip, mind you, but she wasn’t pleased. When we got to the top, dad found her a wheelchair and we pushed her over some surprisingly unwheelchairfriendly paths to the bears. Well, almost to the bears. The path descended into mud and she had to walk the last 20 yards or so. But we got to see bears, at last. One brown and one black. Both orphaned by accidents and unable to be released into the wild. They seemed happy enough. Then we went back into the warm and had lunch in the Altitudes Bistro. I nipped down two flights of stairs to the shop while we waited for our order. The food was superb, although not cheap. Mum and dad had bruschetta and I had a beefburger. By the time we had eaten, it was time to go back down the mountain to catch the shuttle bus back to town. I couldn’t have gone up the turbine anyway, it was a complete whiteout – except for the 45 minutes we were eating lunch, ironically, when it all burned off and the sun came out. By the time we left, it was misting over again. Marvellous. If the Universe is that determined to make it that clear to me that I’m not going up the turbine, I can take a hint. 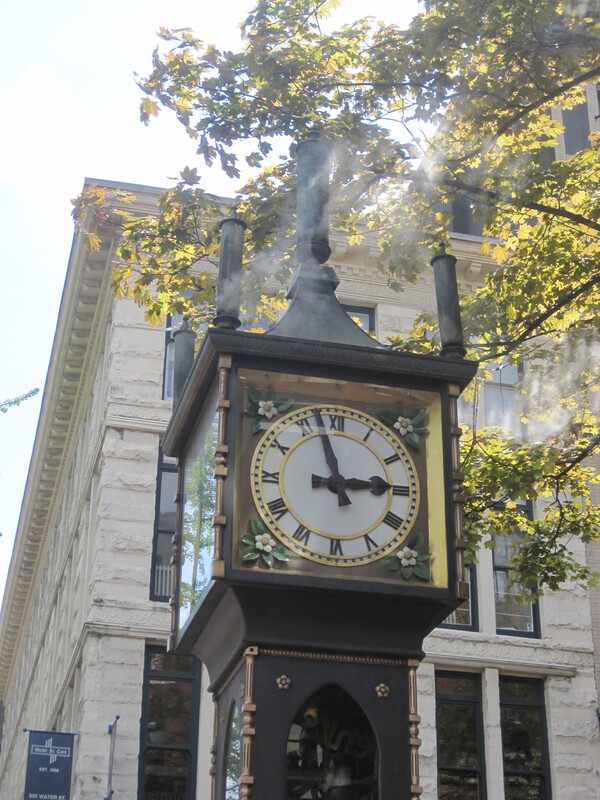 Back in town, below the cloud line, the sun was shining like crazy so we walked to Gastown and paid our respects to the Gastown Clock, which is the only still operational steam-powered clock in the world. At three o’clock (well, five past, but who’s counting? ), it didn’t chime the Westminster chimes, it hooted them through steam whistles! It was absolutely adorable! If only the cow standing next to me had been able to stop talking long enough for us to enjoy it fully. She even counted the chimes, one two, three. I kid you not. I have video with sound to prove it. Stupid cow. Seriously, the world contains a phenomenal number of mouth-breathing morons and travelling a lot, you meet a lot of them. A lot a lot. We then wandered back to the ship and sat in the sun while dad went off in a last attempt to find a wheelchair for the reverse half hour trek back through the terminal. We eventually ended up with two. No, really. You couldn’t make this stuff up. The bloke from the ship first turned up without a chair and had to go back again! After the morning fiasco, this was the last straw and the Canadians were so embarrassed by the whole thing, that the terminal staff found one from somewhere. But the ship eventually sent their pusher back with one as well. We used the ship’s one, because that would go all the way up the gangplank, whereas the terminal one wouldn’t be allowed, but we felt bad for the nice man in the suit who had come down from the terminal office with one. Back on board was 4.30. Heaven only knows why – we’re not due in LA for TWO DAYS! What’s the hurry? Why couldn’t we have left at 6, like we used to in the old days? I blame the Captain squarely for that. Like I said, he doesn’t care about us or our enjoyment. Not one jot. Slept for two hours before dinner. Pushing wheelchairs is hard work. New tablemates: Bill and Carolyn – Canadians from Vancouver – and John and Betty from Norwich. Judgement reserved for now. Ask me again tomorrow. Overall, a surprisingly good day, considering, but let’s face it, it didn’t start well! I’m not sure whether I like Vancouver or not. The bits I saw were pleasant enough, but they have NO public washrooms and even some of their restaurants don’t have washrooms (which is illegal in the UK), and that, plus the wheelchair nonsense and the terminal trek and the not seeing the turbine, made for a rather mixed overall effect. On balance, not a place I would rush back to, frankly. Here endeth Canada. Now we have to be immigrated all over again when we go back into the USA at LA. That’ll be nice then. Judy, Vancouver might have been very nice, if we’d had time to see more of it and hadn’t been so messed about by everybody. Definitely the most disorganised place we have visited and distinctly uninterested in visitors. Will text you tomorrow when we’ve spoken to S&J. K is out of the picture, so it’s just you!